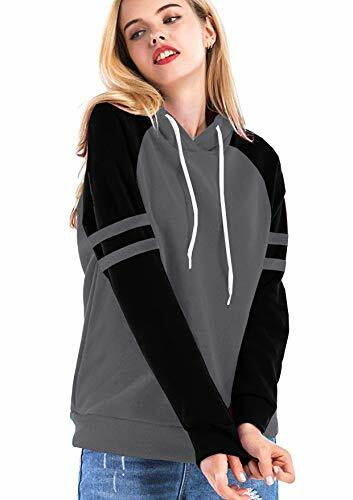 Yidarton Women's Color Block Long Sleeve T Shirt Casual Round Neck Tunic Tops Hoodies(Gray,L) | What Should I Say? M: Sleeve 27.17"-----Bust 39.37"-----Clothing Length 25.98"
L: Shoulder 27.56"-----Bust 41.34"-----Clothing Length 26.38"
XL: Sleeve 27.95"-----Bust 43.31"-----Clothing Length 26.77"
XXL: Sleeve 27.95"-----Bust 45.28"-----Clothing Length 27.17"
A slight variation may occur in colors and size specifications because of manual measurement. Shape retention is good, with high strength and elastic recovery. It is durable, soft and breathable. 2.Design: Contrast color design, with striped pattern on the sleeves, a new trend direction of women clothes. 4.Garment Care: recommend hand-washing or machine-washing with cold water or warm water below 30°. The delivery time is estimated. Actually, items(FBM) generally take 8 - 12 days to arrive. Items fulfilled by Amazon: you can return the item for any reason without paying shipping fee. Items fulfilled by seller: you can return the item for any reason but we will only pay shipping fee if the item is defective or damaged. Please contact us if you have any questions about our products and service, and we will try our best to help you. We are committed to provide the best products with best service. Your satisfaction is totally what we are always chasing for. Garment Care: recommend hand-washing or machine-washing with cold water or warm water below 30¡ã. Size Reference: Hoodies are not the same, please refer to the size chart. See description for more details. If you have any questions about this product by Yidarton, contact us by completing and submitting the form below. If you are looking for a specif part number, please include it with your message.